Writer/producer with overall responsibility for syndicated long-form radio public affairs program airing on hundreds of stations nationally. Duties include maintaining contact with publicists, conceiving story ideas, booking appropriate interview guests, doing research for interviews, carrying out these interviews (largely via telephone), and writing two stories weekly of approximately 11 minutes length in audio magazine form using these interviews. Producer is also responsible for management of program content so it satisfies FCC compliancy needs of affiliate stations. Producer will assist in writing other radio scripts for corporate clients as needed and help contribute to corporate social media presence. Interested? Drop a note to the esteemed Reed Pence—and tell ’im Charlie sent ya. 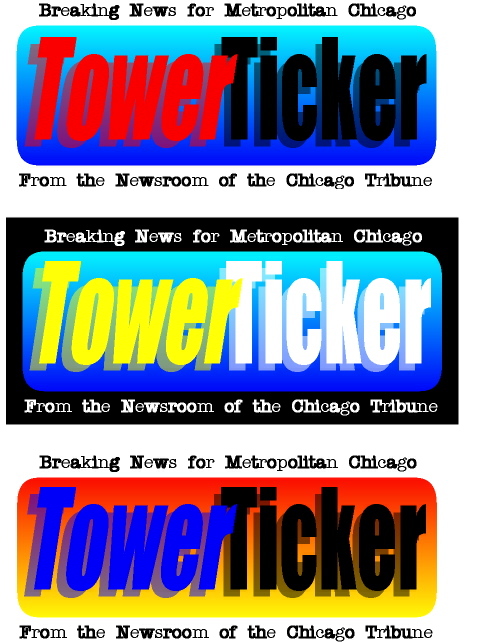 In November 1998, as I was getting ready to leave the radio news business to join the Chicago Tribune’s then-new “breaking news” project, I was asked to brainstorm concepts for what eventually would become Daywatch—a news blog before “blog” was a word, and, later, an email news briefing. My suggestions to name the new project—and my design for logos to match—didn’t make the cut. But, mainly just because I’ve stumbled across the images I mocked up back then, here they are anyway: Proof I chose well by opting against a career as a graphic designer. 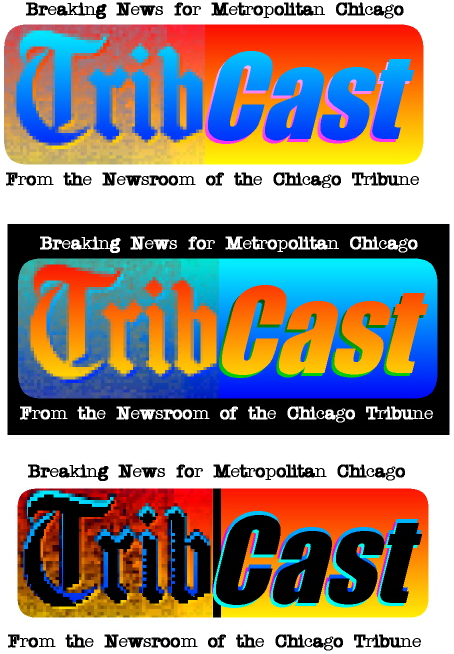 The idea was that the Tribune would bring you news in realtime—you know, sort of like a broadcast from the Tribune over the internet. But this was before streaming audio and video was a thing, and this idea went nowhere. Back in 1998, the name “Tower Ticker”—callback to a Tribune newspaper column of the past and to the wire machines that were going extinct around the same time—drew snickers from some of the team. But, ironically, the name was resurrected a decade later as the title of another blog: The home of Phil Rosenthal’s media reporting—which is where, in 2011 2009, Phil broke the news that I was leaving the Tribune to return to radio as news director at the Trib’s then-sibling radio station, WGN. 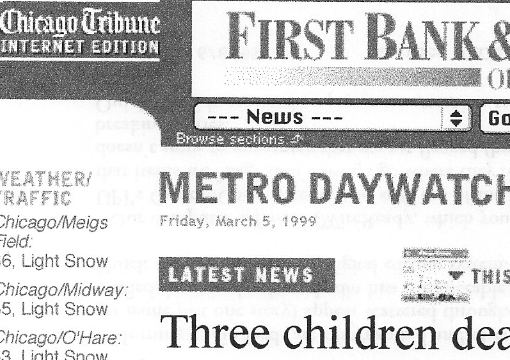 Happily, although it doesn’t look like this anymore, Daywatch lives on as a daily email from the Trib. If you haven’t subscribed, you should. And Daywatch paved the way for the startup I launched in January 2017: Chicago Public Square. You should check that out, too. Here’s my Nov. 2, 1997, interview with Shipler. Sadly, it doesn’t sound dated. Related listening: A panel discussion I led in July 2016 on the future of integration. And this interview with Steve James about his acclaimed documentary series America to Me. And check out even more of my other interviews with thought-leaders through the years on this website, in iTunes, on Spotify, via your favorite podcast player, and at Chicago Public Square. (Updated on the occasion of Stan Lee's death, Nov. 12, 2018. Here’s Stan Lee, the man who created or co-created the core Marvel Comics universe, sitting down during C2E2 at age 94 for what his staff said was his last Chicago comics convention appearance. As you’ll hear, he had energy and enthusiasm to betray his age. More: My interview with Stan Lee in 1998 and my first interview with him in 1975. And check out my other interviews with thought-leaders through the years on this website, in iTunes, on Spotify, via your favorite podcast player, and at Chicago Public Square. Charles Meyerson, big band guitarist and banjoist. Designed by Colorful Revolution Media. Powered by Blogger.